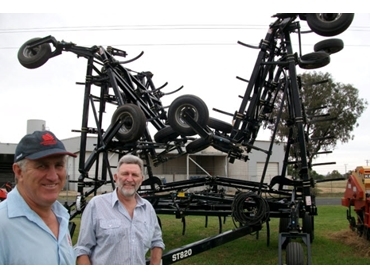 Brothers Ashley and Lex Webster run Geronimo Farm Equipment, the new Flexi-Coil dealership in Dubbo. Both are hands-on farmers who say they understand both the Flexi-Coil product and the broadacre sector better than most. Flexi-Coil seeding and tillage equipment will be easily available to growers in the Dubbo region from January of 2012. The Dubbo branch will be Geronimo’s third Flexi-Coil dealership, joining the Walgett and Moree then partnerships. Ashley and Lex Webster, brothers and Geronimo’s Farm Equipment Directors, are both hands on farmers. They say that they understand the Flexi-Coil products and the broadacre sector better than most. The Dubbo branch will be stocking an extensive range of Flexi-Coil broadacre equipment and is committed to providing competetive deals to its customers across the north west and central regions of New South Wales.